It’s not at all certain that Luther nailed his Ninety-Five Theses to a church door in Wittenberg in October of 1517. Nevertheless, this moment continues to be commemorated as marking the beginning of the Protestant Reformation, an enormously complex series of religious, political, social, and cultural transformations that fractured the Christian church and divided Europe. The lecture considered 1) the significance of Luther’s Theses in the larger historical and theological context of the period, 2) how Luther was imagined and remembered by his contemporaries, and 3) how the shadow of Luther continues to obscure our historical understanding of the sixteenth-century religious reformations five hundred years later. Kirk Essary is a postdoctoral research fellow for the ARC Centre of Excellence for the History of Emotions at UWA. He is an intellectual and religious historian of the sixteenth century, and his first book is Erasmus and Calvin on the Foolishness of God: Reason and Emotion in the Christian Philosophy (University of Toronto Press, 2017). 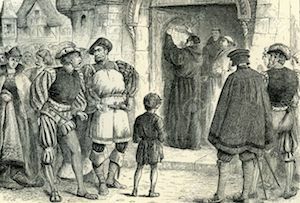 On the 500th anniversary of the beginning of the Protestant Reformation, this UWA Institute of Advanced Studies - Centre for Medieval and Early Modern Studies Lecture Series reconsiders the legacy of Martin Luther, who in 1517 published Ninety-Five Theses criticising the Church's sale of indulgences. From diverse historical perspectives, UWA researchers tackle key issues regarding Luther's life, his thought, and his significance for the momentous changes that Europe underwent during his lifetime.